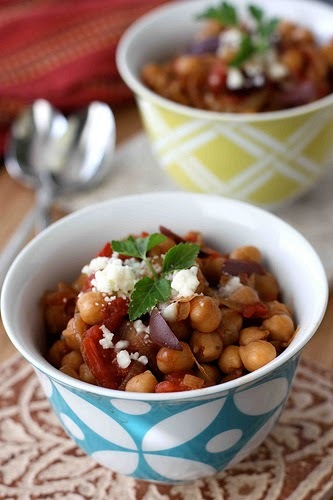 CrockPot Chickpea Stew with Balsamic Caramelized Onions is a healthy option for Meatless Monday! 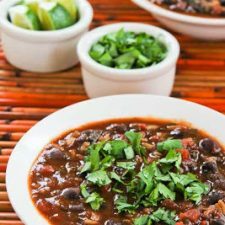 Use the Recipe-by-Photo Index Page for Soups and Stews to see all the slow cooker soup recipes that have been featured on this site. Yes, I know it’s Superbowl Sunday and if you’re using the slow cooker today it’s probably not for a healthy Meatless Monday dish like this Crockpot Chickpea Stew with Balsamic Caramelized Onions from Cookin’ Canuck. But the Superbowl only lasts one day and I think this sounds like a delicious meatless main dish for anyone who’s looking for some healthy food on Monday morning! Or if you don’t care about the whole Meatless Monday thing, eat it for a delicious side dish, but don’t skip Dara’s method of caramelizing the onions before they go in the slow cooker; I can tell this would add amazing flavor to the finished stew. I hope you enjoy trying this from-scratch slow cooker recipe! This link will take you to the complete recipe for Crockpot Chickpea Stew with Balsamic Caramelized Onions from Cookin’ Canuck. Use the Recipe-by-Photo Index Page for Soups and Stews to see all the slow cooker soup recipes that have been featured on this site. Thanks so much for featuring my recipe, Kalyn! This is one of my favorites and I always make a double batch so that I can freeze the leftovers. Dara, I can see why it would be a fave, and great idea to make enough to freeze. In fact, I think this could only get better if the flavor of the onion gets infused into the beans longer!